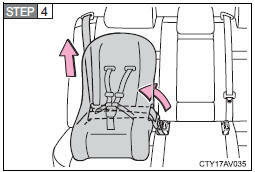 Place the child restraint system on the rear seat facing the rear of the vehicle. 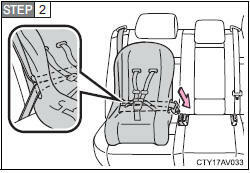 Run the seat belt through the child restraint system and insert the plate into the buckle. Make sure that the belt is not twisted. Fully extend the shoulder belt and allow it to retract to put it in lock mode. In lock mode, the belt cannot be extended. While pushing the child restraint system down into the rear seat, allow the shoulder belt to retract until the child restraint system is securely in place. 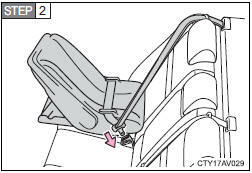 After the shoulder belt has retracted to a point where there is no slack in the belt, pull the belt to check that it cannot be extended. 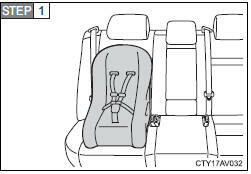 Place the child restraint system on the seat facing the front of the vehicle. 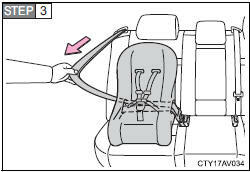 While pushing the child restraint system into the rear seat, allow the shoulder belt to retract until the child restraint system is securely in place. If the child restraint has a top tether strap, the top tether strap should be latched onto the top tether strap anchor. Sit the child in the child restraint system. 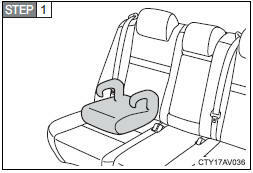 Fit the seat belt to the child restraint system according to the manufacturer's instructions and insert the plate into the buckle. Make sure that the belt is not twisted. 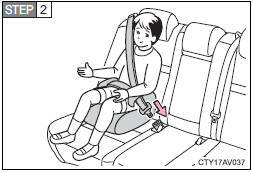 Check that the shoulder belt is correctly positioned over the child's shoulder and that the lap belt is as low as possible.